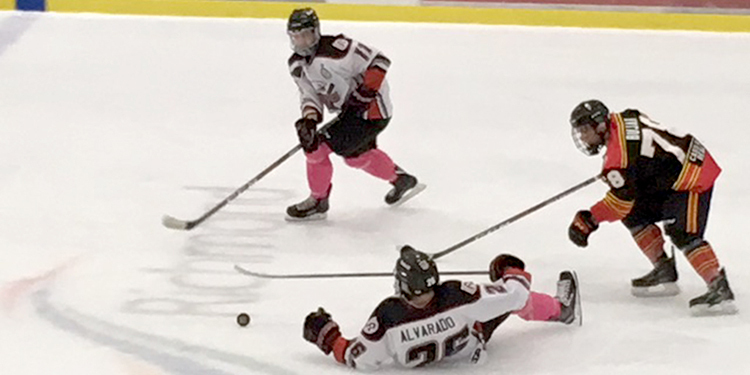 Richmond Sockeyes' rookie Isaac Alvarado was unceremoniously tripped moving the puck up ice during a recent game against the Ridge Meadows Flames. A familiar scene is playing out in the Pacific Junior Hockey League’s Tom Shaw Division and again the Richmond Sockeyes are front and centre. Despite losing most of last season’s Cyclone Taylor Cup championship roster to graduation, the Sockeyes continue to play at a level befitting the winning that has come to characterize one of Canada’s elite junior hockey franchises. Nineteen games into the 2018-19 season, the Sockeyes are a mere four points back of the North Vancouver Wolf Pack in the standings with a game in hand. Longtime arch rival Delta Ice Hawks are equal in points, with 28, but having played one more game than the Sockeyes. 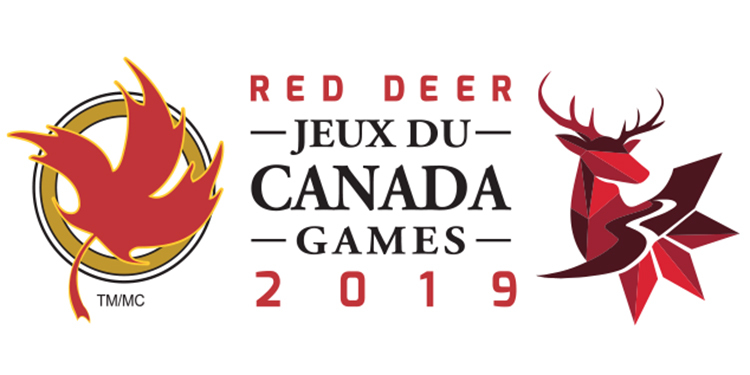 After starting the season Sept. 6 with a 2-2 tie against Delta (who they defeated for the 2018 provincial Junior B hockey championship), Richmond completed the opening month with six wins over the next seven games. Then in October, after dropping their second game of the season 4-1 at Langley, the Sockeyes proceeded to reel off another six wins during their next nine games, followed by a 2-1 loss in White Rock to the expansion Whalers Nov. 1. Richmond (13-4-1-1) has scored 30 more goals (70 to 40) than their opponents through 19 games. At their peak, following a 9-0 win over Port Moody Sept. 29, the Sockeyes were averaging 4.1 goals per game and allowing 1.9 goals against. Their season average has levelled out to 3.5 goals per game for and 2.1 per game against. Much of Richmond’s success under second-year bench boss Brett Reusch (a Sockeye alumni) can be attributed to committed team play. Marcus Pantazis, 18, leads the team, and rookies, with 24 points (10 goals) in 19 games. That’s 11th-best in the league. Pantazis, one of 16 rookies on this year’s Sockeyes, has a point in four of his last six games. The fact that the top seven scorers on the team (three rookies) are all in double digits in points further reflects how balanced the overall scoring is. Veteran forward Isaac Embree has been the biggest scorer of late, with eight points (six assists) in his last six games. Second-year defenceman Jacob Keremidschieff has six points (five assists) in his last six games. But, as with any successful team, defence must also be a priority. The Sockeyes 2.11 goals against average is the best in the league, thanks in large part to the consistently strong goaltending of Jeremy Kelleway who sports a spectacular 12-3-1 record and an equally-stellar 1.69 goals against average. Only twice this season has he given up more than two goals—three on two occasions. He has also earned two shutouts. Kelleway’s save percentage is nearing an out-of-this-world 95 per cent. 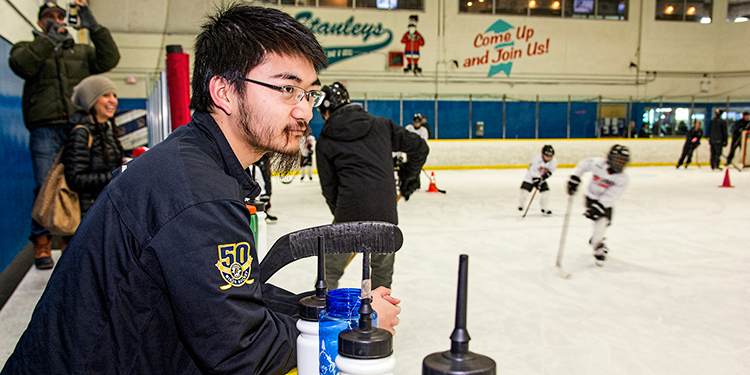 The Sockeyes have five games remaining this month, with home games each Thursday at 7 p.m. at Minoru Arenas. Tickets are available at the door.